96 feet x 10 feet. This work was made in the entrance ramp to the Art Gallery of Ontario as part of the Wallworks series – a series in which artists were invited to create works directly on the gallery walls. 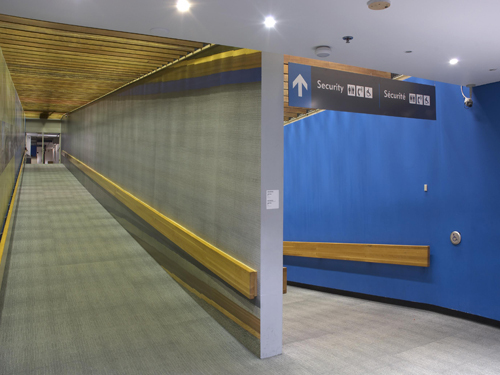 The ramp was photographed as described below, and then the images were stitched together digitally and printed onto vinyl which was then attached directly to the wall running up the ramp. A camera was attached to a custom-built horizontal track and pointed down towards the floor, which was then photographed in one-foot sections. The focus was fixed so as to be sharp at the bottom of the ramp, and so, as the camera progressed up the ramp, not only did the images become out of focus, but the area being photographed became increasingly smaller. In other words, the specific architecture of the ramp caused the camera to zoom in on and lose focus of its subject - the very thing that brought about this specific photographic process in the first place.